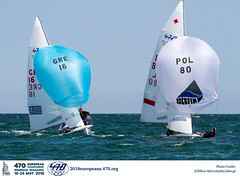 Don’t Cry For Me, Argentina Fortune is a relative concept, as Argentina’s Sebastian PERI BRUSA and Santiago MASSERONI discovered on day three of the 470 Junior European Championship at Lake Balaton. They thought they’d had a bad race, but when they came ashore they’d discovered others had suffered a much, much worse day. And so, somewhat to their surprise, the only South Americans in the 92-boat fleet find themselves at the top of the leaderboard at the end of the qualifying session. Each of the three divisions, blue, pink and yellow, needed to contest just one race this morning to complete the six-race qualifying series. From tomorrow the 470s will divide into gold, silver and bronze, so today’s single race was a crucial one. It was also a very tricky one, as the sailors started in 15 knots and finished in a drifter. Those that finished at all, that is. But more of that in a moment. In the first flight to set off, the blue division, the French team of Beranger BALZEAU and Mathieu FOUNTAINE backed up yesterday’s statement of intent - that they are here to win this Championship - with a dominant performance. They staked their claim on the lead in the stronger winds and extended on the fleet as the breeze died. The second boat across the line - GER 18 - was not so lucky as helm Tim ELSNER saw his sail number written on the dreaded blackboard. The German had been OCS at the start, and he banged his tiller extension on the side deck in frustration. The Argentineans couldn’t even count their position across the line, they were that far back. “It was a difficult race for us,” said MASSERONI. “We had good speed, but we had a few tactical problems, couldn’t find our way, so we finished very badly, but I don’t think it changes the results, we are still in the fight.” They certainly are, sitting in the overall lead. By the time the next division finished, the breeze was desperately fickle. The Russian team of Vladimir CHAUS and Denis GORETY crossed first, just seconds in front of fast-closing Portuguese brothers Antonio and João ROSA. Reigning Junior World Champions Sofian BOUVET and Jeremie MION had been having a good race, for a while. “We were first for nearly the whole race,” said Mion, “but we did the second upwind very badly, and dropped to 6th or 7th. At this point the wind dropped very quickly.” The French team ghosted across the line, not even flying their spinnaker, as it had become impossible to set it. With a 20-minute time limit after the first boat finishing, almost no others in the pink fleet managed to cross the line. They were scored DNF for Did Not Finish. The yellow fleet were last to start but their consolation was that no one reached the finish line, so the race committee abandoned and re-started their flight in the early afternoon. By this time the breeze had returned to a brisk Force 4 to 5, champagne sailing. 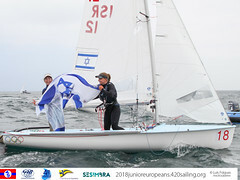 Italians Simon SIVITZ KOSUTA and Jas FARNETI won the re-race, moving them up to 5th overall. Tomorrow it will get even tougher, as the top sailors are united for the first time in gold fleet finals, with the other competitors in silver and bronze. 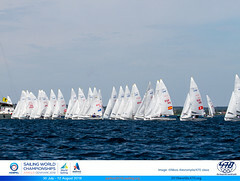 Today dealt some hard lessons in sailing, but such is life in a fleet as competitive as the 470.